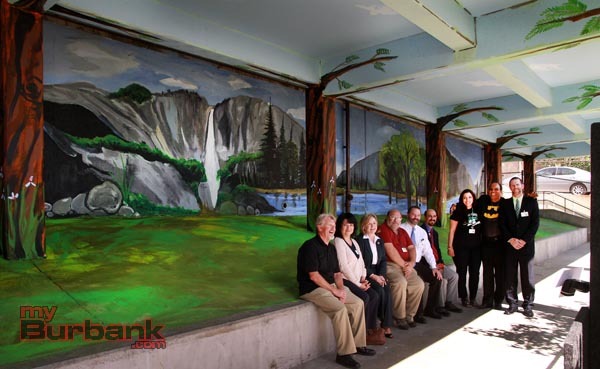 On California’s John Muir Day, April 21, John Muir Middle School held a celebration debuting the nearly-completed Yosemite Valley art installation painted by local artist Randall Williams with help from many of the school’s students. The event was attended by many local city and school officials, Muir students and members of the community, including Board of Education members Larry Applebaum, Dave Kemp and Ted Bunch, Superintendent Dr. Jan Britz and BUSD officials Dr. Tom Kissinger, Sharon Cuseo, Emilio Urioste and Peggy Flynn. Councilmember Jess Talamantes, former Muir Principal Bruce Osgood and Burbank Arts For All Foundation Director of Development Trena Pitchford were also in the audience. Students “learned that art takes time and it’s a process,” he added. Williams drew his inspiration for the Yosemite Valley art installation from Ansel Adams photographs of Yosemite National Park. Adams was, in turn, inspired to spend years making images of the natural beauty in the area after reading Muir’s descriptive writings about Yosemite. 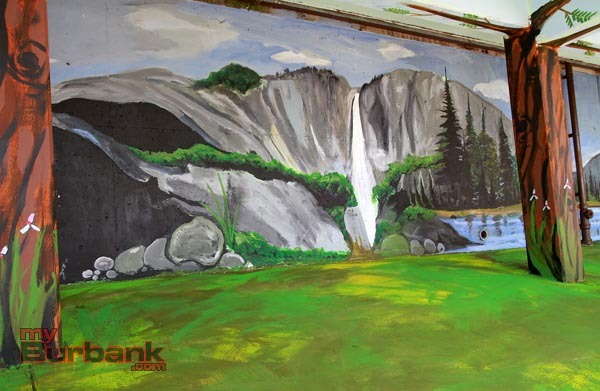 “The splendor of the Yosemite Valley is in this painting in the sixth grade lunch area,” Miller added. He also talked to the attendees about Muir’s legacy in founding the Sierra Club. 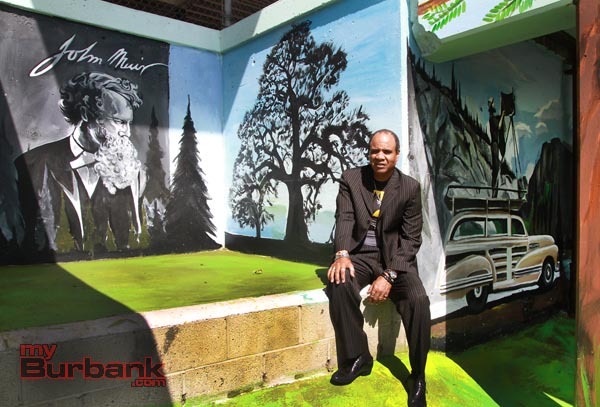 While the initial cost of the mural, $5000, was funded in by Logix Credit Union and BAFA, the total is close to $7000. 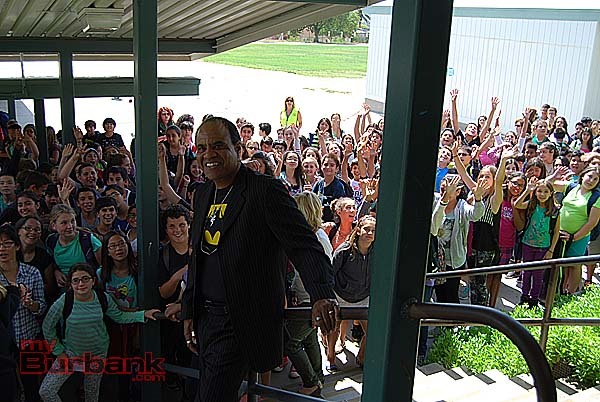 Additional funding was provided by Muir’s Associated Student Body (ASB) and some of the money the school received as payment for hosting filming on campus after school hours. Miller didn’t want cost to be a factor in the ultimate result. Miller, a former math teacher, measured the installation at over 5400 square feet. When finished, the artwork will incorporate three-dimensional elements throughout the installation. 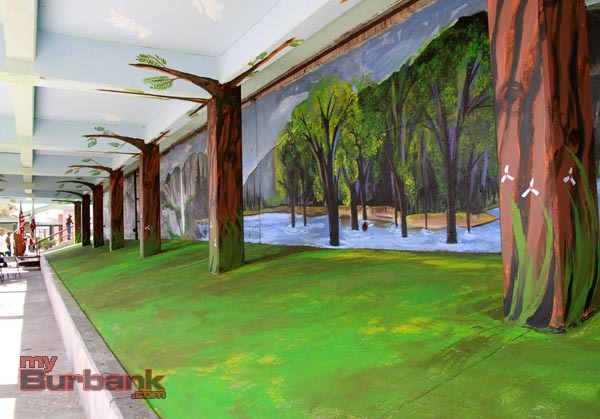 Acrylic paint was used for long-lasting hardiness on the concrete poured over 30 years ago. 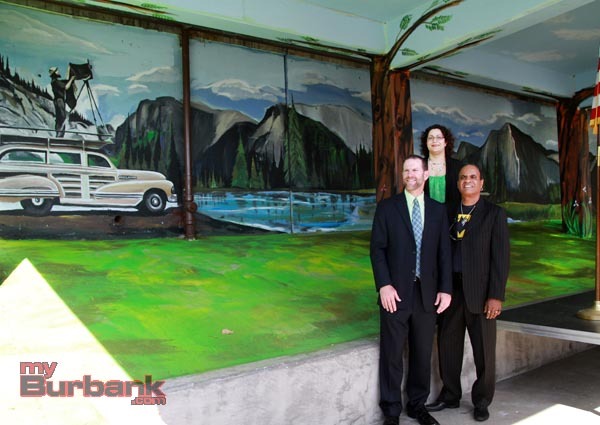 Yosemite Valley mural is the largest mural in the Burbank Unified School District and quite possibly, the largest in the city of Burbank. Haley Briggs, also in sixth-grade, thought watching Williams paint was awesome. “It was really cool because when he was making the John Muir portrait he had a little picture of John Muir taped up next to the wall and he was listening to music and dancing and painting,” she explained. All the girls agreed it will be a lot more fun to eat in the space, also called Osgood Pavillion in honor of former Principal Osgood. Once the Yosemite Valley art installation is complete, in the coming weeks, the sixth-graders’ round lunch tables will be moved back in and the students will reclaim their now-vibrant space. 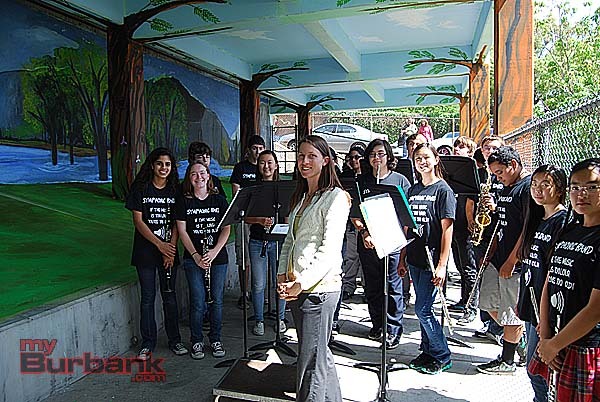 This entry was posted in News, Schools and tagged bafa, Burbank Arts for All Foundation, greg miller, john muir day, John Muir Middle School, logix credit union, randall williams, yosemite valley art installation, yosemite valley mural on April 24, 2014 by Lisa Paredes.